(Nanowerk News) A new study from North Carolina State University shows that size plays a key role in determining the structure of certain hollow nanoparticles. The researchers focused on nickel nanoparticles, which have interesting magnetic and catalytic properties that may have applications in fields as diverse as energy production and nanoelectronics. "The principles we're uncovering here have great potential for nanofabrication – the creation of materials that have very small features, with many applications in fields ranging from electronics to medicine," says Dr. Joe Tracy, an assistant professor of materials science and engineering at NC State and co-author of the study. "This study improves our understanding of hollow nanoparticles and is a foundation for future work on applications in ultra-high density magnetic recording and more efficient catalysts, which is useful for chemical production, waste treatment and energy production." At issue is the oxidation of nickel nanoparticles. If you start with a "core" piece of nickel and oxidize it, exposing it to oxygen at high temperatures, the structure of the material changes. If the material is partially oxidized – exposed to oxygen and high heat for a limited time – a solid nickel oxide shell forms around the material. 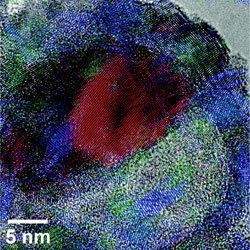 Image of a half-oxidized 26 nanometer nanoparticle. The nickel region is colored red, and the nickel oxide is colored blue and green. If the material is exposed to heat and oxygen for a longer period of time, further oxidation occurs. The external shell remains, but nickel is transported out of the core, leaving a void. If the material is fully oxidized, a larger void is created – leaving the nickel oxide shell effectively hollow. This conversion of solid to hollow nanoparticles is known as the "nanoscale Kirkendall Effect." But what NC State researchers have found is that the size of the nickel core also plays a key role in the structure of these particles. For example, in smaller nickel nanoparticles – those with cores having diameters smaller than 30 nanometers (nm) – a single void is formed inside the shell during oxidation. This results in an asymmetric core of nickel, with a single void growing on one side of the core. The remaining core shrinks as the oxidation process continues. This is significant, in part, because the nickel oxide shell becomes progressively thicker on the side that abuts the core. The larger the core – within the 30 nm limit – the thicker that side of the shell becomes. In other words, you end up with a nickel oxide shell that can be significantly thicker on one side than the other. However, the researchers found that larger nickel nanoparticles do something completely different. The researchers tested nanoparticles with nickel cores that were 96 nm in diameter, and found that the oxidation process in these nanoparticles created multiple voids in the core – though the core itself remained completely surrounded by the nickel oxide shell. This process effectively resulted in the creation of bubbles throughout the core. The "skeletons" of those bubbles still remained, even after full oxidation, creating an essentially hollow shell that was still criss-crossed with some remnants of the nickel core. "This tells us a lot about how to create nanoscale structures using the nanoscale Kirkendall Effect," Tracy says. "It's a building block for future research in the field." The study, "Large, Solution-Processable Graphene Quantum Dots as Light Absorbers for Photovoltaics" is published in the journal ACS Nano. The research was funded by the National Science Foundation and NC State, and is co-authored by Tracy, NC State undergraduate Justin Railsback, NC State Ph.D. student Aaron Johnston-Peck and former NC State postdoctoral research associate Dr. Junwei Wang.